This does not involve connection issues, but general UI bugs that you might face. Open ProtonVPN application-> Find Help on the toolbar while the app is opened->Click on Clear Application Data. This will delete any information related within ProtonVPN. 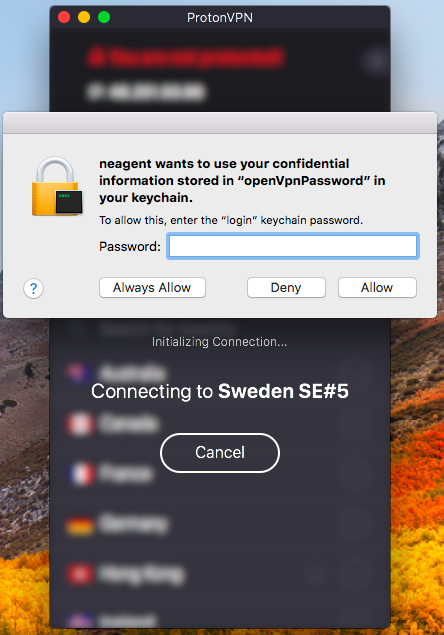 This error message is received in the login process, after entering wrong credentials several times into the neagent when trying to establish a connection to the VPN server previously. Log out of your Mac user account and log back in. This error message is displayed when there is something wrong with login services. It could be an issue with your network, or ProtonVPN infrastructure downtime/maintenance. Restart your mac device and check the application again. Check if you are able to reach our website or ProtonMail website. Check if you can login on other devices. Go to system preferences > network > disable and enable Wifi or simply unplug Ethernet cable from your mac and plug it again. Give it a few minutes and try logging in again. If you do get a response from those links, ProtonVPN services are working and there could be something with your network or device. If you do not get a response from both actions, please contact our support team with this data as well your machine information and ISP. Are you from restricted network area? For example China, UAE, Turkey, Egypt, Syria, Cuba, Saudi Arabia, Iran and many others. Or maybe you are using your work network that could have restrictions? If so, your ISP might be targeting and blocking access to ProtonVPN services and blocked the access to it. In that case try setting up tunneblick connection method which uses OpenVPN. this requires 12.2 but my OS X only goes up to 12.1, do you have an older version that will work on my computer? I am getting an “internal API error” (in red) when opening ProtonVPN for the first time on MacOS High Sierra. Why it kept on asking for password? When i’m connecting to united states? I have the same dreaded “Keychain error”. It seems ridiculous to have to logout and reboot my machine anytime I want to connect to the VPN. If I wanted to do retarded windoze type reboots every time I do something I wouldn’t be using a UNIX based OS. Please fix this issue, it’s obviously not user error, but something within the scope of your vpn application. Hello Henry. Please press CMD+ Space (search bar will appear)> type Keychain Access> press on the lock in the corner (in order to have administrator privileges)> in the same window search bar type- “VPN”. Right click and choose Delete all the files related to ProtonVPN, OpenVPN or Tunnelblick. This will delete remembered passwords for connections that you had with our servers. After all of this try connecting again, it should prompt you for your credentials, keep in mind that it may also ask for your Mac’s user account info too. 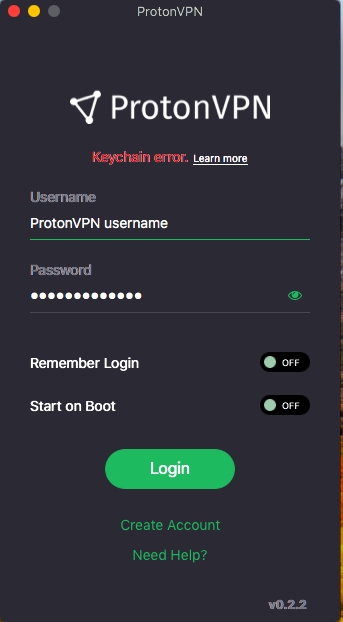 Regarding the “Keychain error” message I can say that it is not occuring in non-root users on macOS X High Sierra (version 10.13.6 Beta (17G39b)) with ProtonVPN on version 1.2.3. However, if logged into the root user I will always get this error message. I think it’s due to the right management in macOS but it may be worth including that in the article. I get a sad face over the message “Connecting Failed” and the options [Cancel] and [Try again]. Using ProtonVPN on Win 7 works fine using my ISP, Bredbandsbolaget/Sweden. Any chance that this will come to older but still supported versions of macOS (thinking 10.12)? I have some older machines which I can’t upgrade to 10.12 that I still use and would love the convenience of the ProtonVPN app. Hello Chris. Sadly, for now there are no plans to support older macOS versions that are below 10.12. We`ll let our customers know on social media if any changes will come. I often travel to China, UAE, Qatar, Turkey, … May I use MacOS beta from there or only tunnelblick and securecore ? Hello. Currnetly macOS application will most likely not work due to its used IKEv2 protocol, but it can work, it only depends on ISP most of the times. The best working solution is Tunnelblick as it uses openvpn which is working most of the times in restricted countries. I have tried restarting my MAC and starting again from scratch – i get the same issue. Am I missing something? Hello, May we ask, what application version do you have installed? Try using this application which has it fixed, then update to the latest one. Hi – i downloaded the client from the protonvpn site at the time that i tried this originally. Unfortunately I didn’t have a chance to try this again until today and your download link has expired. Is the fix that you mention in the beta software generally downloadable from the protonvpn site now? I’ve tried downloading this and following the instructions again. I still cannot get the application to run. It installs and i can double-click on the icon but it does nothing at all until i get an error message that states that the application closed unexpectedly. The log has the same error message as before “Termination Reason: Namespace CODESIGNING, Code 0x1”. Any idea if there is anything else i can try or should i give up? I have tried my correct password for OpenVPN. 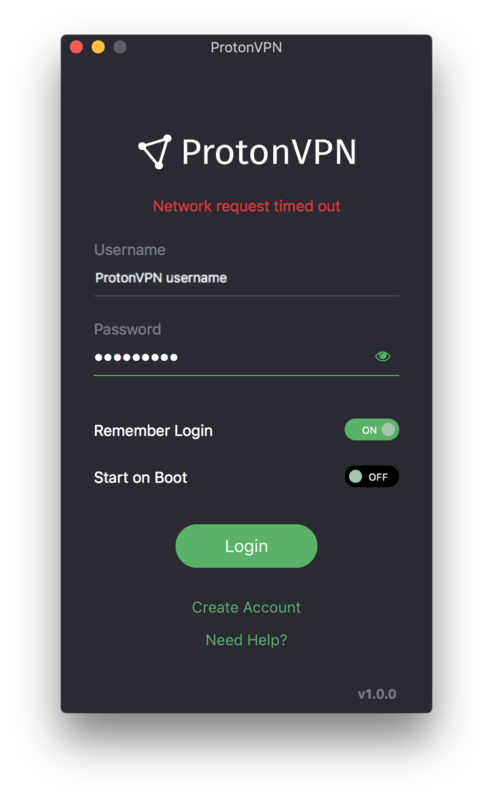 I tried the correct password for ProtonVPN. I tried the correct keychain password for my computer. I restarted my application. Still nothing. I have been at this for over an hour. What exactly is keychain password for OpenVPN if it is not the same as the OpenVPN password? May we ask, have you tried restarting your mac? When keychain access comes up, you have to enter your Mac User password that you use to log in to your laptop.